The top U.S. Army commander in Europe does not think it’s likely to get more soldiers permanently based, so his short-term goal is making 30,000 troops look like 300,000. Lt. Gen. Ben Hodges, U.S. Army Europe commanding general, said efforts are the result of Russia’s aggression in Ukraine changing the security environment, with all 28 NATO nations aligned in opposition to the annexation of Crimea and other moves. 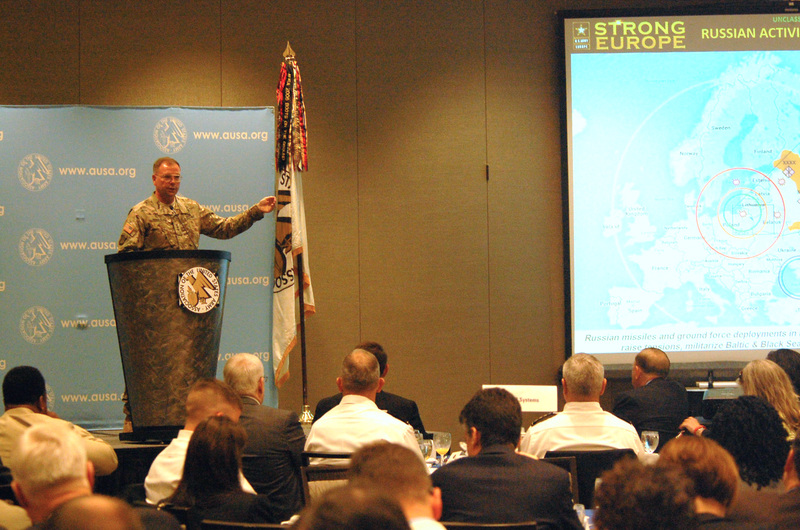 Speaking at a breakfast hosted by the Association of the U.S. Army’s Institute of Land Warfare, Hodges said, “I don’t anticipate Russia intends to take the rest of Ukraine.” However, basing and deployment decisions could make it difficult for the U.S. and allies to respond to further aggressive action, he said, particularly since Russia has shown it has the ability to rapidly move large numbers of troops and equipment. White House and DoD officials are considering picking up the pace of rotational moves of U.S. units into Europe, especially Eastern Europe; and increasing the amount of forward-deployed weapons and equipment, including heavy armor. About 300 Army paratroopers are expected to remain in Ukraine through mid-November to provide training, Hodges said, and it’s possible they could remain longer. While expanded resources are being considered, “the challenge is, how do we take 30,000 and make it look like 300,000?” Hodges asked, referring to the current number of U.S. Army soldiers permanently based in Europe. The 30,000 level seems fixed, short of some emergency, he said. “We are not going to get 30,001,” he said to describe the cap he sees on Army troop levels. “Nobody wants to take 5,000 troops out of Fort Hood and send them back to Vilseck,” he said of the expected reaction of trying to move soldiers from a U.S. domestic base to Europe immediately after the Army announced which bases would lose troops as a result of a 40,000 cut in active-duty personnel over the next two years. Pending other decisions, Hodges described four steps to making 30,000 troops look 10 times larger. More responsibility is being given to non-commissioned officers and junior officers in Europe, especially on rotational moves and deployments into Eastern Europe. The National Guard and Army Reserve are being asked to help, with discussions underway about getting some Guard units to leave equipment behind in Europe to shorten future deployment times. Every resource is being used to help, including assets from allies. “We have to use other people’s stuff,” Hodges said, noting as an example that the U.S. Amy lacks bridging equipment in Europe so it’s relying on allies’ equipment. The pace of exercises also has risen. Fifty training exercises a year “is the new normal,” he said.